It is available in a number of colours. 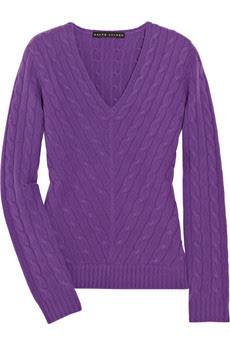 The colour above is 'Wexford Purple'. 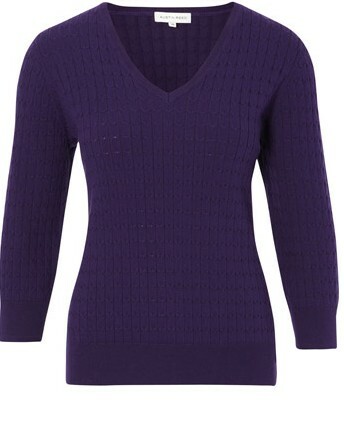 Similar sweaters can be purchased on the high street or by designers. On Kate's trip to Tesco she wore the beautiful Aquascutum Club Check Scarf she previously wore whilst canoeing in Canada, It is currently on sale. The scarf, made in Italy would be ideal for Winter. To complete the look simply scrape your hair back and team with your favourite skinny jeans! Let me know if any of you emulate the look. Any photos? I shall add them to the blog! On another note I am delighted we are seeing so much of Kate recently, After their return from Canada St James's stated we wouldn't see the Royal couple much this year. I can hardly imagine seeing Camilla shopping at Tesco which is why William and Kate are a breath of fresh air. Looking forward to seeing what she wears next! Is that still available right now?